The best way to activate and stimulate denervated muscles. The RISE Stimulator, developed for people with a flaccid paralysis, is a new development in the area of electrical stimulation. Unlike the traditional FES system, the RISE Stimulator can be used in a flaccid (non-spastic) paralysis, better known as a low transverse lesion. In some cases, the FES system cannot be used. The RISE stimulator makes it possible to stimulate degenerated muscles even when this is the case. It is even possible in rare cases to stimulate the muscles in the legs in such a way that the patient can stand up upright. The muscles in the legs are being assisted by the electrical impulses. The RISE stimulator works independently and cannot yet be combined with one of our BerkelBike models. WANT TO KNOW MORE ABOUT THE RISE? Its easy-to-use and compact size make the RISE Stimulator unique and perfect for home use. You only need to wet the sponge covers for the electrodes and place them on the muscles that will be stimulated. Elastic bands keep the electrodes in the right place during stimulation. The stimulation process can be easily controlled with the controls and can be observed on the screen. WHO BENEFITS FROM THE USE OF THE RISE STIMULATOR? A flaccid paralysis is caused by a transverse lesion that damages the nerves and is characterised by a complete loss of muscle function. Due to the nerve damage, there are no uncontrolled contractions or spasms. Examples of conditions that may benefit from the use of the RISE are plexus brachialis, transverse lesions with Cauda Equina syndrome and conus medullaris syndrome. Degenerated muscles can only be stimulated directly; the muscles are not stimulated through their corresponding nerves. 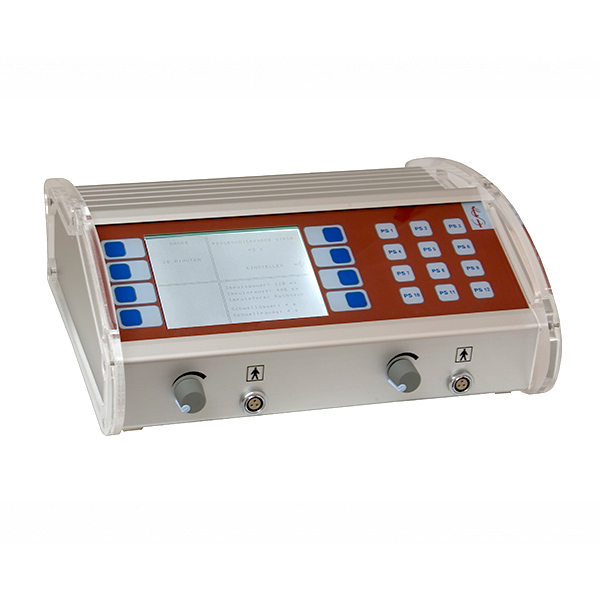 Instead, the electrical impulses from the RISE stimulator are applied directly to the muscles. In order to induce muscle contraction by direct stimulation, longer and more powerful electrical impulses are required than can be provided by FES. FES is only suitable for paralysed muscles with intact motor nerves. The RISE Stimulator has an electrical output with impulses up to 300 mA, with durations up to 200 milliseconds. With regular use, the RISE Stimulator can promote muscle build-up and recovery. 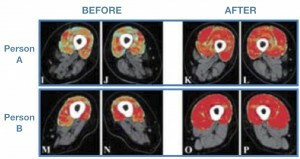 The following pictures of an MRI scan show how the muscle mass in patients’ legs has increased after regular training with the RISE Stimulator. The pictures show a cross-section of the leg muscles of two people. The top four photos are from one person, the bottom four of the other. The left-hand pictures were taken before treatment and the right-hand pictures show the condition after four years of regular training with the RISE Stimulator. Electrical stimulation does not only increase the muscle mass, it also aids the recovery of muscle tissue. 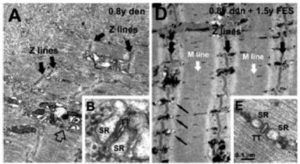 Photo A is a picture of a muscle taken lengthwise with an electron microscope. Normally, vertical lines should be visible in the muscle tissue. However, this muscle has been inactive for about ten months and, as you can see, the structure has almost disappeared. Photo D shows the same muscle after one and a half years of stimulation with the RISE Stimulator. 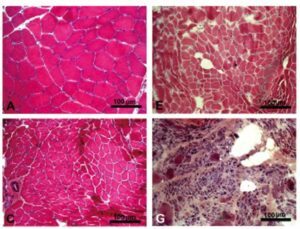 The difference is striking; the structure of the muscle tissue, as shown by the vertical lines, is now clearly visible. On the right you will see optical microscopic images showing the muscle fibers of the muscle. Photo A depicts a healthy muscle. The large and healthy muscle fibers are visible. Photo C depicts a muscle of a person who has had a spastic muscle paralysis (UMN) for twenty years. The muscle fibers have shrunk. Photos E and G have been taken of two people with a flaccid paralysis (LMN). The muscle fibers have shrunk even further. In spastic paralysis, the muscles remain partly active in a way due to the spasms. Because of this, the muscle fibers remain better intact than in a flaccid paralysis. 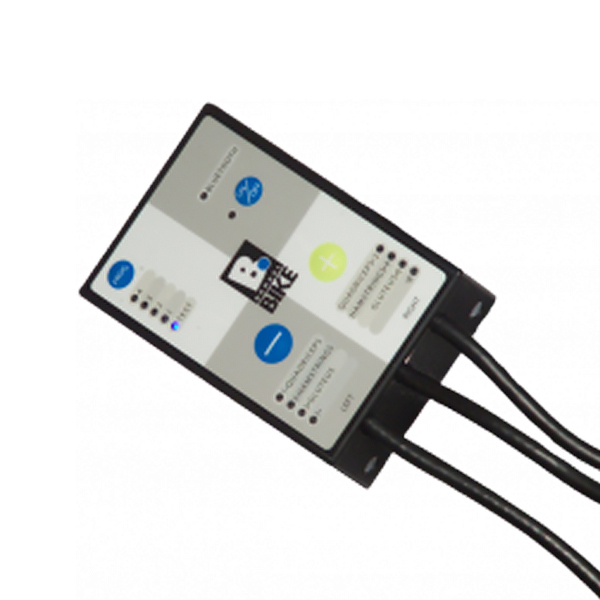 Meer weten over de RISE Stimulator? Whether the RISE Stimulator is suitable will depend on your medical condition. Because the stimulation is much more powerful than is observed in nerve stimulation, there are more exclusion criteria: stimulation on top of metal implants is prohibited; people with a pacemaker, bladder stimulator or artificial circulation pumps need permission from their attending physician; the RISE Stimulator should not be used during pregnancy.